The Tigard Public Library is doing their annual survey. It asks people about their experiences at the library, asks for users to rate customer service, and asks what types of programs people might attend. Please fill in the survey online here. Paper surveys will also be available at the library from Sunday, February 3rd to Saturday, February 16th. The WCCLS website will be unavailable on Tuesday, January 29th at 9:00 pm, for approximately one hour. This is in order to perform scheduled maintenance. Do you have kids doing homework, or need to research a topic using a reliable source? 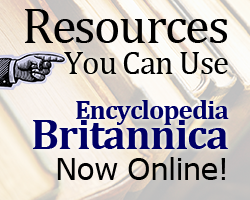 You can now access the full content of Encyclopedia Britannica online, through WCCLS. Tax season is upon us, and we have compiled a page of resources to help you get through it. All WCCLS member libraries except Tualatin Public Library and Tigard Public Library will be closed on Monday, January 21st, in observance of Martin Luther King, Jr. Day. Learn more about Martin Luther King, Jr.
WCCLS has a new blog! 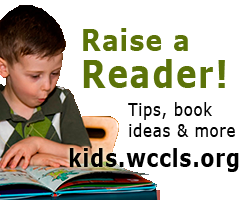 WCCLS Kids is written by our Youth Services Librarian, who has lots of information to share about kids, reading and books. So far the blog has covered tips for getting active kids sitting through a whole picture book, titles to help kids build their vocabulary, and fun books the featuring giant squid! Visit kids.wccls.org to see the latest posts. You can subscribe to the blog by email, or grab the blog's RSS feed. Thanks to a new program in Oregon, you can get a card at different libraries across the state! If your job or vacation plans take you to different parts of Oregon, you can now access the library that is most convenient for you. How does it work? 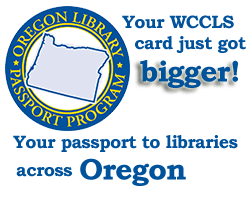 Your WCCLS library card allows you to get library cards at other participating libraries across Oregon. For example, take your WCCLS card to the Astoria Public Library and use it to apply for a card there, without paying the usual out of area fees. You still have to return materials you check out in Astoria to the Astoria Library. There is no delivery between libraries in this program. Check this list to find out which libraries participate in the program. Our info page tells you about getting a WCCLS library card, and has details on how you can use other libraries in the Portland metro area.